Did the pioneers know how to count? One thing many people don’t understand is Buffalo’s numbered streets. Sure, we don’t have a perfect numbered grid like New York City, but our radial street pattern and unique street names are important to the City of Buffalo’s identity. (Also, it gives me a reason to blog). Why do they start with number 4? Why do they skip numbers? Why don’t they make any sense? One thing that I knew about this area of the City is that it had seen a lot of changes. The land was originally part of the Upper Village of Black Rock, which was originally owned by New York State. 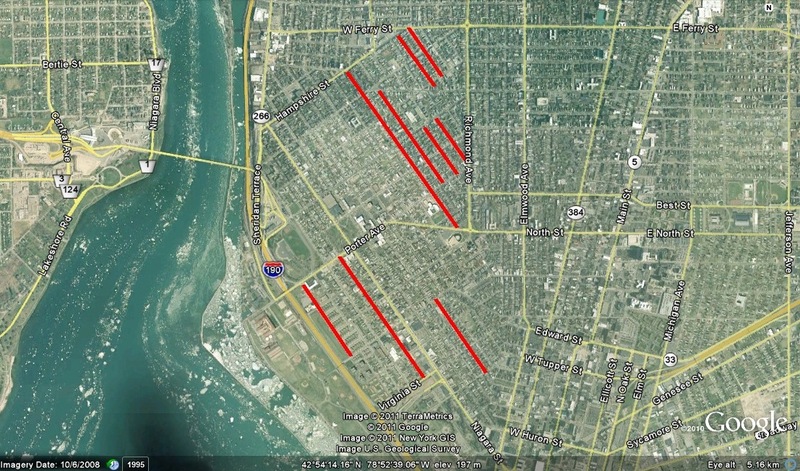 Black Rock was a separate village that was annexed by the City of Buffalo when it was incorporated in 1832. 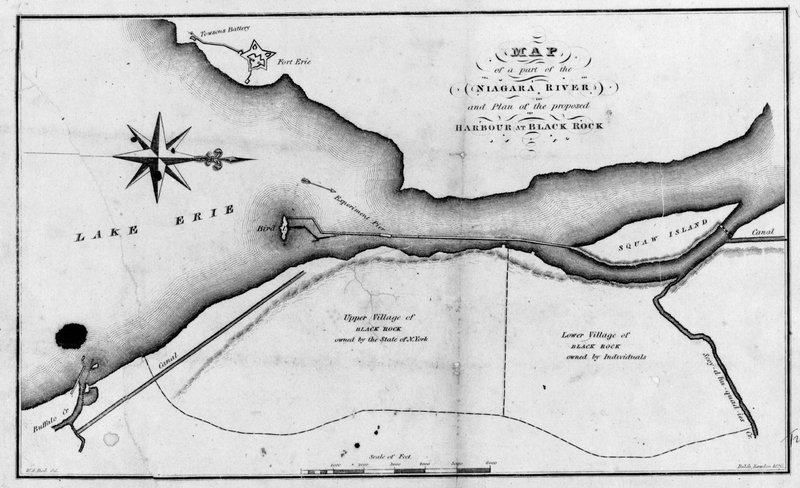 The Erie Canal cut through Black Rock in 1825 on its way to Buffalo. When the canal heyday ended, the canal bed was converted to a railroad corridor, and which eventually gave way to the Thruway (I-190). The configuration of streets in this area also changed several times due to the Peace Bridge configuration. In my quest to learn more about the numbered streets, I decided to take a look at some historic maps of Buffalo from the 1830s. I realized that other streets used to have numbers! Here’s a map showing the locations of these street. The current name of the street is shown in parentheses. As the map shows, once you add back the streets formerly numbered, the historic street grid of Black Rock begins to make sense. Additionally, I found an 1834 Erie Canal survey and learned that 2nd and 3rd Street used to run on either side of the canal. These streets are buried under the Thruway now. Additionally, running along the waterfront in this area was Main Street. It was a common practice back then for Main Street to represent 1st Street and street numbers would start with 2nd. So, these numbered streets which remain, essentially they’re remnants of streets that haven’t been renamed yet. Maybe we should change that. Who would you like to see a street named after? W.B.Gilbert. 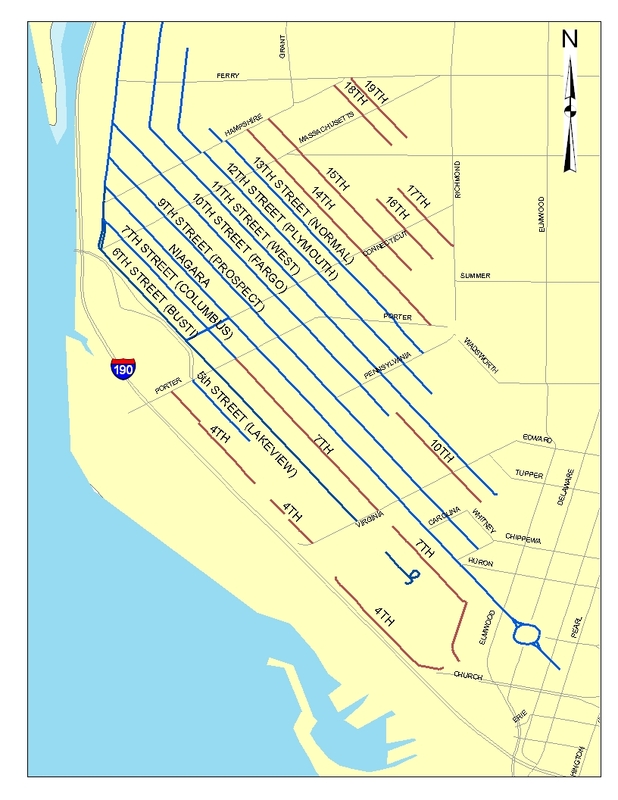 “Map of the City of Buffalo”. Published by A Willits, 1835. David Burr. “Buffalo”. Atlas of the United States/New York/Atlas of New York, 1838. Holmes Hutchinson. Survey of Erie Canal. 1834. One idea would be to name the streets after all the mayors. Another would be for more of the other pioneers to which contributed to Buffalo’s fame as the Queen City. Does anyone have any info on fillmore and 4th or fillmore and 1st that is where am grandparents lived and had a barber shop.